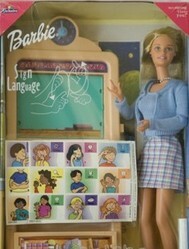 Having a deaf family member made me more aware of toys for hard of hearing or deaf children like this ASL Barbie Doll. The American Sign Language Barbie Doll captured my attention because I had a brother who was deaf and disabled. I notice things that would mean something to the deaf and disabled more quickly, perhaps, than someone who doesn't have a family member who is deaf. Barbie is such a popular doll, and it means a lot to see the doll adapted to the different needs of children. This doll is not readily available in stores, but you can find them available online if you know where to look, so to help, I thought I'd share information about the doll, and some sources, all in one place on this page. 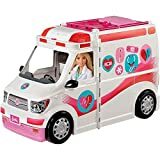 You will learn more about this special Barbie Doll below, and can decide if it is something the deaf or hard of hearing child in your life may enjoy. This doll was released in 1999 and available in stores in 2000. It is my understanding that it is no longer readily available in stores, but I haven't had any trouble finding it online. One source said it was designed with the help of the National Center on Deafness. The doll comes with Barbie's hand signing "I Love You", a special sign to me as I used it to tell my brother I love him often. I lost my dear brother to brain cancer at the end of June, 2015. It is a painful loss. The doll comes with a "cling on" board with a clock that has movable hands, and pictures that include the sign for each picture. The complete ASL alphabet is on the back of the box. You can read more about American Sign Language (ASL) below. 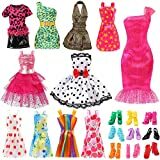 The ASL Barbie can be used with all the usual cloths and accessories available for any other Barbie Doll, some examples are shown below, and the doll itself later on the page as well. Where Can You Buy this doll? There may be occasions when none are available below. Please look closely to determine whether these are new or used, and what condition they are in if you are considering giving as a gift. Look closely at the pricing. I have noticed that some ask an excessively high price depending upon availability at the time. For a new doll, $35 - $60 seems a reasonable price to pay, and if it's less and in new condition, all the better...oh, and watch out for shipping rates! Gifts and resources to simplify and aid communication with friends and family members that we love who are deaf or hard of hearing. To the right is an ASL chart for you that is available and free to use as it is in public domain. It shows the signs for each letter in the alphabet. Feel free to print it. Obviously sign language isn't always spelled out in letters, one by one, but for some things we use a single letter in our family. For example, my name starts with a C, so we used the letter C to speak about me to my brother. Thank you for visiting today, if you have any questions or just want to say hello, I'd love to hear from you. @WriterArtist Yes, it is a very special doll, I was drawn to it the first time I saw it. 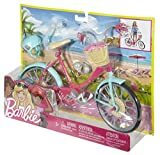 I am amazed with what Barbie ASL is equipped with, indeed we are thinking more in terms of handicapped who would love to have these gifts. A beautiful collection from the Barbie doll collections.